The trolleybus no. 20I of the Czech type ŠKODA 8 Tr10 came on 14 April 1969 from Gera and had have there the car no. 312. The trolleybus was scrapped. This photo show the trolleybus no. 20I of the Czech type ŠKODA 8 Tr10 with trailer at the former final stop and today's turnaround loop Westend/Boldtstraße. The articulated trolleybus no. 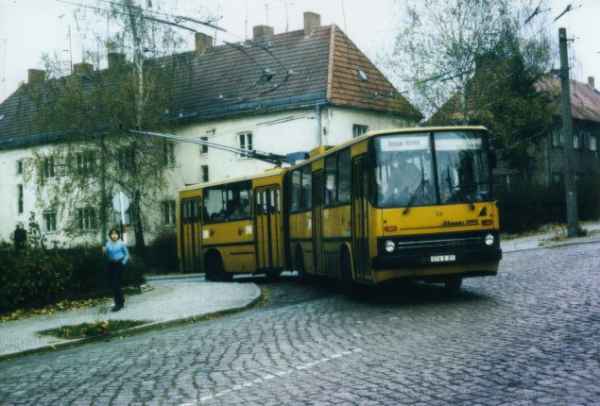 20II of the Hungarian type Ikarus 280.93 came on 03 November 1987 from Weimar and had have there the car no. 8027. The documents of the trolleybus no. 020 was from the Weimar trolleybus no. 8021. The photo show the articulated trolleybus no. 20II of the Hungarian type Ikarus 280.93 at the crossing Saar-Straße (before: Otto-Krachel-Straße)/Freienwalder Straße going in direction to Markt. The former articulated trolleybus no. 020 of the Hungarian type Ikarus 280.93 was taken out of service by the BBG Ltd. and sent to Timisoara/Romania on the 28 August 1995. The articulated trolleybus had there the car no. 12. 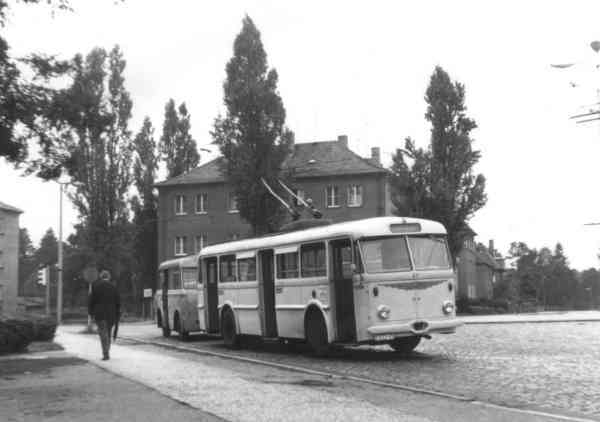 The photo show the former Eberswalde articulated trolleybus no. 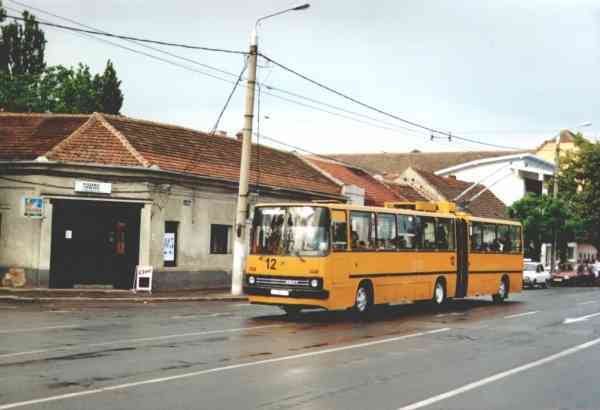 020 of the Hungarian type Ikarus 280.93 in Timisoara/RO with the car no. 12 on 31 May 2001.